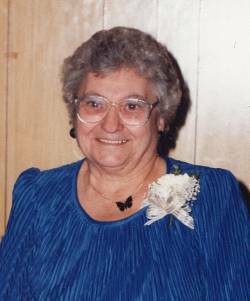 St. Albans – Rose Claire Lamothe, a lifelong area resident passed away Thursday, August 17th, 2017, at The Villa Rehab Center. Born in Bakersfield, on August 7th, 1925, she was the daughter of the late Arthur and Maria (Paquette) Gendron. Rose was 92 years old. On October 18th, 1943, in East Fairfield, Rose married Henry L. Lamothe, who predeceased her on October 23rd, 2008. They were married for 65 years. Rose enjoyed a good game of “500”, was an avid bingo player, attending the Owl Club, St. Mary’s and the Franklin County Senior Center bingos and was known to many as the “Tupperware Lady”. Survivors include her five children, Marcel Lamothe and wife, Doris, of St. Albans; Lillian DeCell and husband, George, of St. Albans; Gloria Blessington of Lake Charles, Louisiana; Donald Lamothe of St. Albans and Claire Ordway and husband, Denis, of Henderson, Nevada; five grandchildren, Shannon Laroche, Michael Blessington, George DeCell, Jr., Michelle Lamothe and Roy Blessington, as well as nine great grandchildren, two great-great grandsons and another great-great grandchild due in January. Rose is also survived by her sister, Cecile Garrett of East Fairfield. In addition to her parents and husband, Henry, Rose was predeceased by her great-grandson, Jordan Laroche, granddaughter, Kathy Lamothe Thibault; son-in-law, Terrance Blessington, Jr. and sisters, Mary Jane Mitchell, Rita Flanders and Gertrude Ashline. Relatives and friends are invited to attend calling hours on Tuesday, August 22nd, 2017, from 11:30 AM to 1:30 PM at the Heald Funeral Home, 87 South Main St, St. Albans. A Mass of Christian Burial will follow at 2:00 PM at Holy Angels Church, 245 Lake Street, St. Albans with the Reverend Joseph Ikegbunam as celebrant. Interment will follow in the family lot in the St. Albans Bay Cemetery. Those planning an expression of sympathy are asked to consider Franklin County Home Health Agency, 3 Home Health Circle, St. Albans, Vermont 05478. To send Rose’s family a written expression of sympathy, or share a memory, please go to her on-line guest book at www.healdfuneralhome.com.